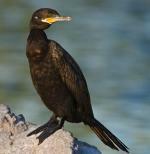 Double-crested Cormorant: Breeds locally from Alaska, Manitoba, and Newfoundland south to Mexico and Bahamas. Spends winters mainly on coasts north to Alaska and southern New England. Preferred habitats include lakes, rivers, swamps, and coasts. Captive birds will perch to dry their wings after eating, even if they have not gotten wet. Due to significant population increase and range expansion, the U.S. Fish and Wildlife Service published an Environmental Impact Statement on managing Double-crested Cormorant populations in 2003. The oldest documented wild Double-crested Cormorant lived to be seventeen years, nine months. The average lifespan of wild birds is about six years. A group of cormorants has many collective nouns, including a "flight", "gulp", "rookery", "sunning", and "swim" of cormorants. 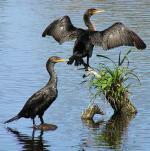 The Double-crested Cormorant has a large range, estimated globally at 3,200,000 square kilometers. It is native to the nations of North America and many island nations and has been seen in various countries throughout Europe. 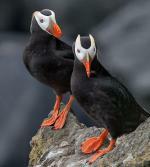 This bird prefers wetlands and neritic or coastal marine ecosystems. 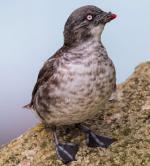 The global population of this bird is estimated to be 1,100,000 to 2,200,000 individuals and it does not appear to meet population decline criteria that would necessitate inclusion on the IUCN Red List. The current evaluation status of the Double-crested Comorant is Least Concern.